Re-posted from Howard’s Archaeodeath blog. 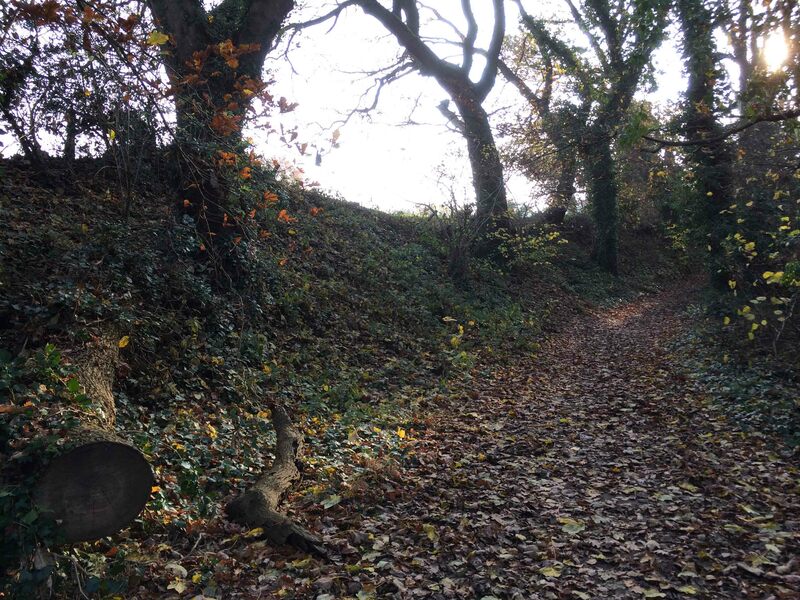 Last year, Dr Keith Ray and I explored the line of Wat’s Dyke around Holywell and Basingwerk, Flintshire. Recently, I went back to explore Wat’s Dyke at its significant northernmost section in more detail. I came to some further (and I think rather significant) observations regarding how the Dyke is behaving as it navigates the Greenfield Valley. 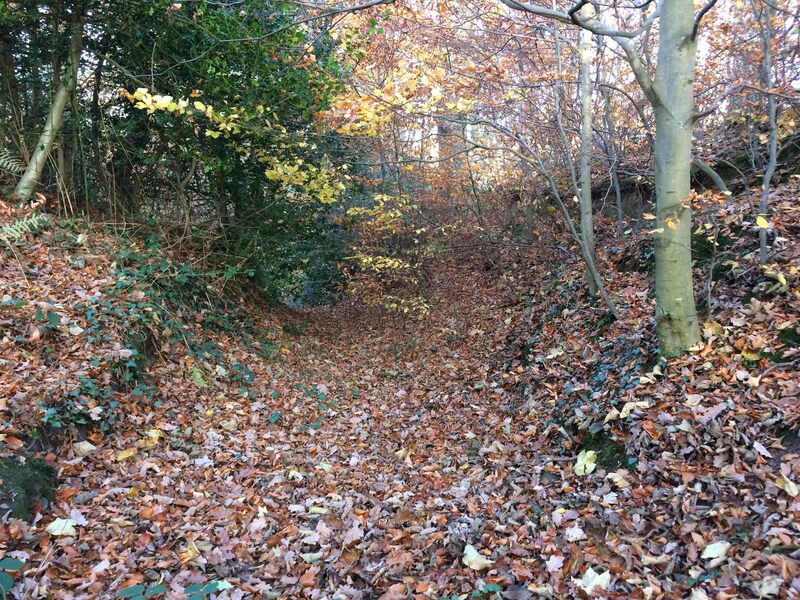 What Keith and I failed to do was explore in detail the surviving line of the dyke in the Greenfield Valley as it ascends from Basingwerk south up a south-east side of the valley towards the upland around Holywell called The Strand. 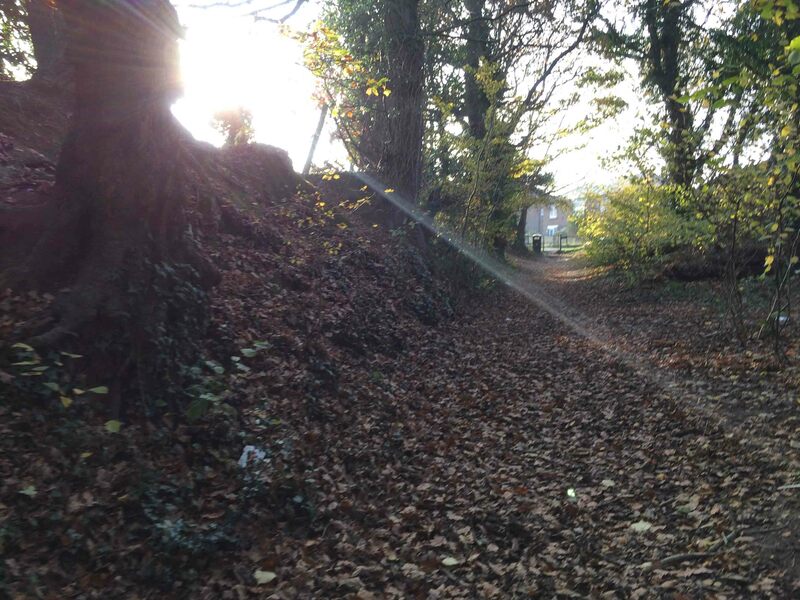 Here, in Strand Coed (Strand Wood), the Dyke isn’t identified with surety. Wat’s Dyke was until recently visible as a partially levelled bank with deep W. ditch, 150 years in length, on high ground E. of Holywell, known as the Strand. The construction of a row of cottages has caused the ditch to be filled in for use as a roadway, but traces of the bank still survive. 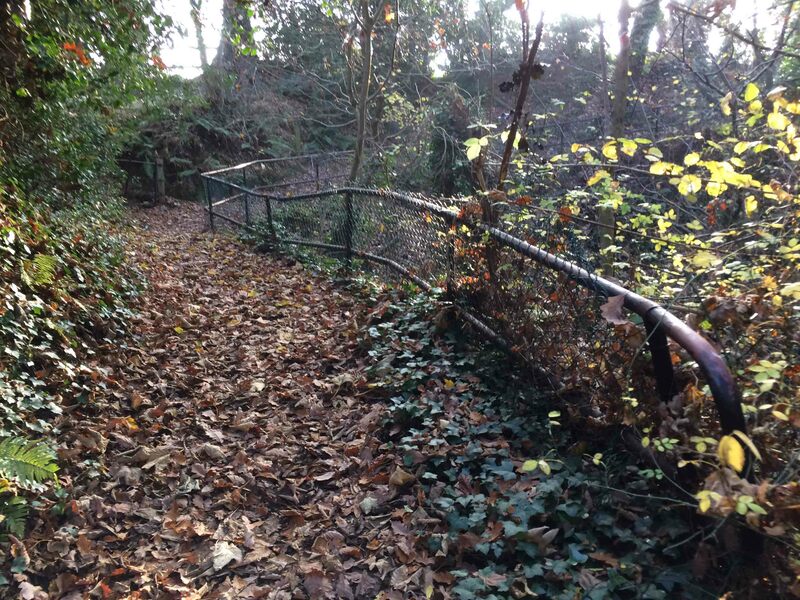 There is now no visible evidence of the Dyke on its traditional line northward from the Strand along Strand Walk, but the alignment of this Walk on to the point where the tiny valley of the Strand becomes a ravine is very suggestive of its former existence. 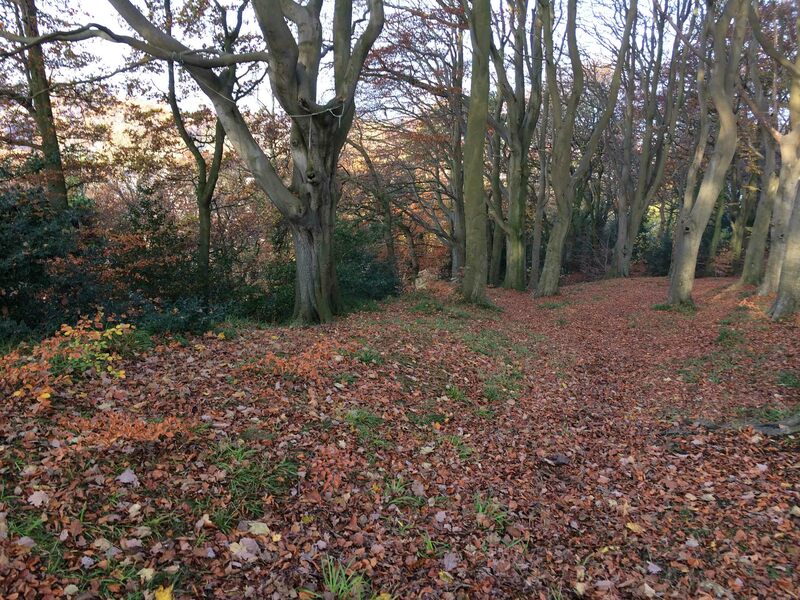 So Fox argues that the path known as Strand Walk might follow the line of the dyke from the relatively flat upland area east of the Greenfield Valley where it is heading for the Bagillt Brook – the Strand – northwards as it descends down into the Greenfield Valley. Well, I agree with Fox that there is no demonstrable trace of the dyke in terms of bank or ditch. 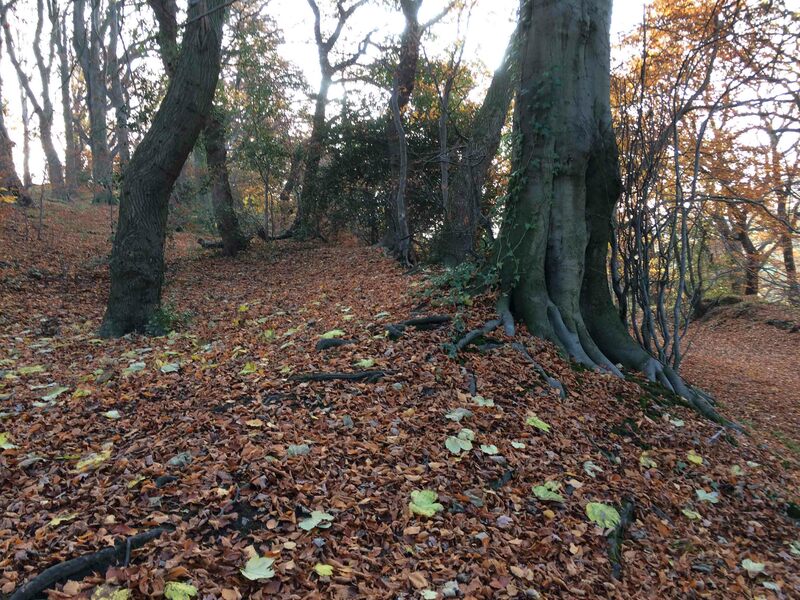 However, the line of the Walk he describes is unquestionably a notch below the top of the slope that is a very good candidate for having previously been the line of the ditch. The bank, if it had ever existed, would have been the slope itself, and at the top of the slope where the modern field boundary runs. So I would suggest that Fox is overcautious in his determination here, and the Walk is in fact following the ditch of the dyke as it navigates the east side of the ravine at a consistent c. 2.5-3m vertically downslope of the top of the ridge. We can look at this another way: there is no other way the Dyke could have navigated a path between the surviving section of to the north (see below) and the historically attested line of the Dyke on the Strand to the south. If we don’t believe this is the route: there is no other option for how it would have once existed elsewhere. The implications of this are, however, not made clear by Fox. The Dyke neither hugs the top edge of the Greenfield Valley south of this point: it heads across flat hilltop towards a high point by/at the Holywell Windmill before descending towards the Bagillt stream. Likewise, it doesn’t continue north along the edge of the valley which would have required it to jump around another ravine to attain higher ground once more. 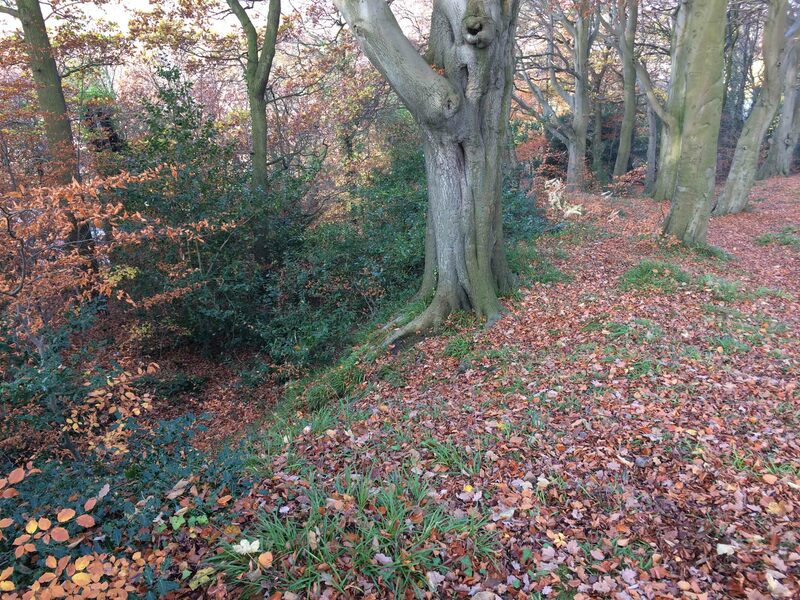 Instead, it uses the ravine here to descend north/ascend south between high ground and the valley bottom. In so doing, it marks a course direct for the spur that became occupied by the Cistercian abbey of Basingwerk in an unquestionable fashion. 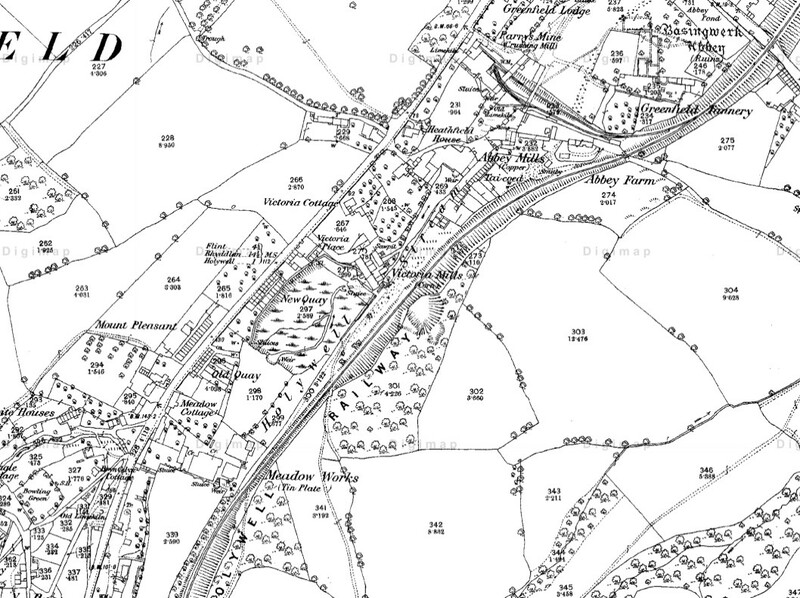 Extract from the 1st edition OS survey map showing the surviving Dyke crossing north over the Strand towards Strand Coed and the proposed route down the ravine on its eastern side. This ravine opens out above Meadow Mills on the flank of the deep trough valley carved out by the Holywell stream: and here a small piece of bank is seen, 21ft. in breadth, with an over-deepened W. ditch, which is possibly part of the Dyke. It seems to die out in the railway cutting. Beyond this point northward nothing recognisable as Wat’s Dyke is to be seen. Here, the Dyke is discernible, and while maps make it seem as if it is continuing its route following the contours, the closer examination shows it is doing anything but. 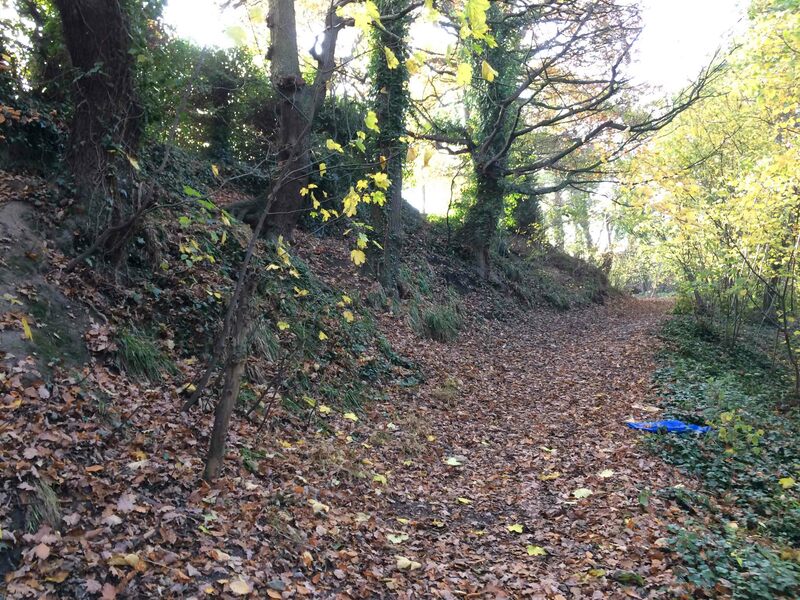 As mentioned above, the surviving section is cutting across the contours, heading down into the valley north/ascending up to the top of the ridge of the Strand Coed ravine to the south. Therefore, if this is indeed the line of the Dyke, it is doing something very significant at this point: dropping in an unprecedented fashion down into the valley, not to cross it, but to follow it down towards the estuary of the Dee at Basingwerk. Looking north-west, the bank can be discerned as the dyke descends into the Greenfield Valley, with a possible quarry ditch behind it. Wat’s Dyke as it descends into the Greenfield Valley and ends without further trace where it is cut by the line of the raillway cutting.